Optimum’s President, Nooshin Yazhari, has been awarded the International GRIT Award of 2018! Optimum’s President, Nooshin Yazhari, has been awarded the International GRIT Award of 2018! On Thursday, March 8, 2018, Experience Energy, the global careers site that connects energy companies with diverse talent, celebrated International Women’s Day with the first-ever GRIT Awards, honoring more than 30 energy leaders from around the world during the third annual HERWorld Energy Forum. The GRIT Awards, sponsored by Audi of Central Houston and Gapingvoid, were created to recognize women leaders in energy, and the men who advocate for their progress. More than 200 applications poured in from North America, the United Kingdom, Europe, Africa, Asia, Russia and the Middle East. In the end, Experience Energy, a Pink Petro company, honored more than 30 women and men from a range of companies, including Halliburton, ConocoPhillips, Aera Energy, Shell and Chevron, at an event that was streamed live online to 74,000 viewers. Optimum’s very own president, Nooshin Yazhari, was awarded as a leader in the Energy industry in the area of Entrepreneurship. 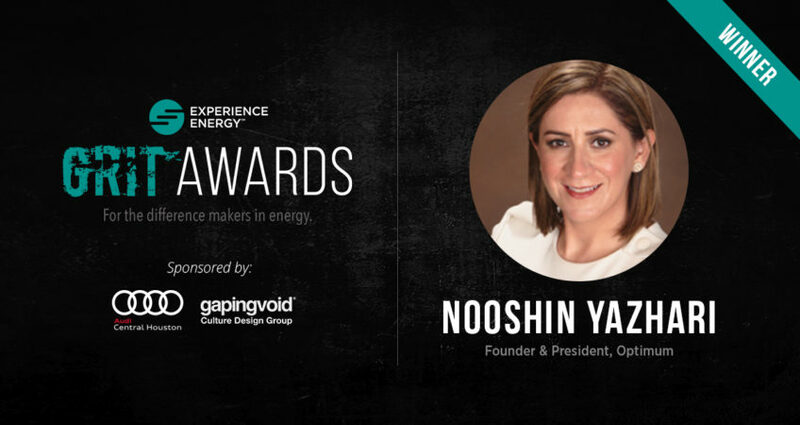 Nooshin is recognized for her inspiring and devoted passion and commitment to bring innovation, optimization, and automation to the Energy industry for making things better for the community and our industry.